Laos is famous for its preserved nature and its life around the Mighty Mekong. 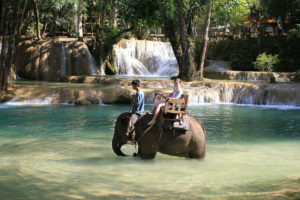 We propose you another way to travel around the Land of a Million of Elephants, by visiting its astonishing waterfalls. Nong Khiaw is a charming village situated in the north of Laos. Nong Khiaw is famous for its nature, trekking and its beautiful view point. There, you can find all the commodities you need: accommodation, various restaurants and even spas for every budget. About 100 of waterfalls are located around Nong Khiaw, along the Nam Ou River. Good to know: You must deserve the waterfalls. Only a hike would allow you to discover them, hidden in the jungle. When you arrive at Kwang Si village, the trip begins. Go for a walk, admire traditional wooden houses, and look for delicious fish or meat skewers before entering into the waterfalls. Do not forget to take your swimming suits! 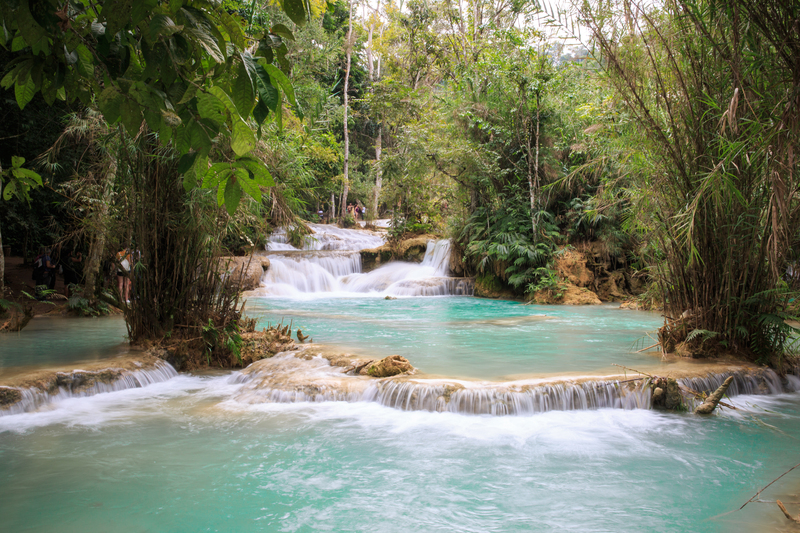 Enjoy a relaxing cooling break in one of the numerous natural pools of Kwang Si. Better to go in the early morning for a moment of peace with practically no one around you. Few minutes walk from the Kwang Si waterfalls, you can also visit the Butterfly park, a nice initiative that sensitize people about the beauty and fragility of Lao butterflies. Good to know: There are bears to see on the waterfalls park. 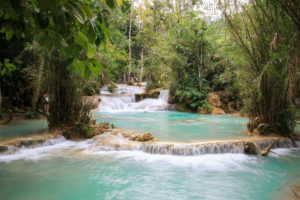 Tad Sae waterfall is accessible by road but the best would be to go there by boat from Luang Prabang or a village nearby. Tad Sae is wide. The water flux is used by locals as motor. They installed a millstone with a water wheel to mill cereals. This technic is still used today. No need to bring food with you for your day at Tad Sae. You will find restaurants there with a wonderful view and reasonable prices. 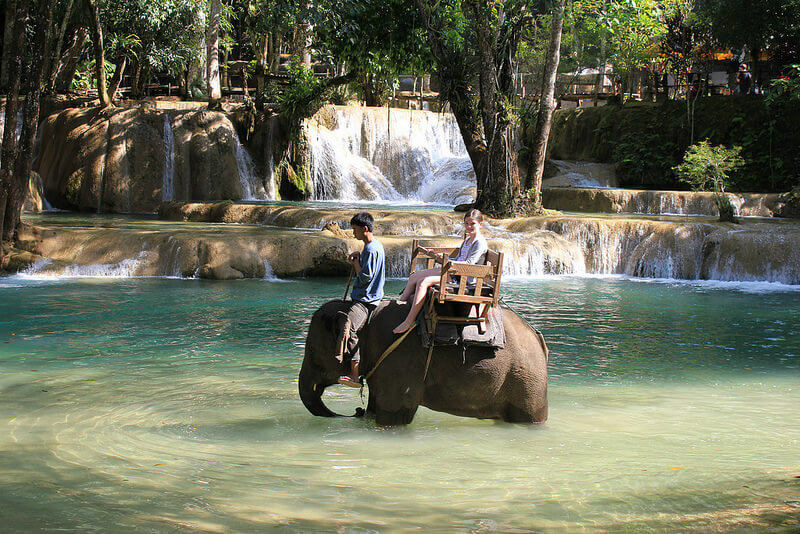 Good to know: There is an elephant camp right next to the Tad Sae waterfalls. Perfect for a nice day in the lush nature of Laos. The Tad Fane waterfalls are the highest in Laos. Those 2 sister waterfalls are about 100 meters long, down a steep cliff into a gorge. 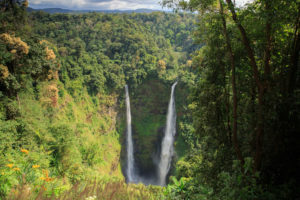 Situated into a National Park, the Tad Fane waterfalls offer a spectacular tropical rainforest with preserved wild life. Leopards, tigers, elephants, monkeys and over 300 bird spices are living in the area. Bolaven Plateau is also famous for producing the best tea and coffee in the country, thanks to a perfect climate. 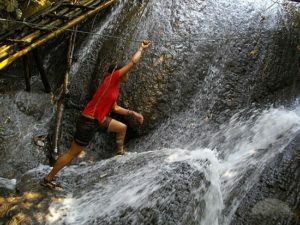 Good to know: The waterfalls are more impressive during the rainy season, between June and September. Khone Pha Pheng is located in the south of Laos, in the “4000 Islands”. 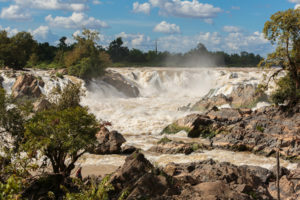 These waterfalls are the largest in Laos, creating a huge step on the Mekong river bed. Thousands of birds are living around the waterfalls, in inaccessible islands and rocks. These waterfalls are marking a natural border between Laos and Cambodia. It blocked the French colons project of linking China and the Ocean via the Mekong River in the 20th century. 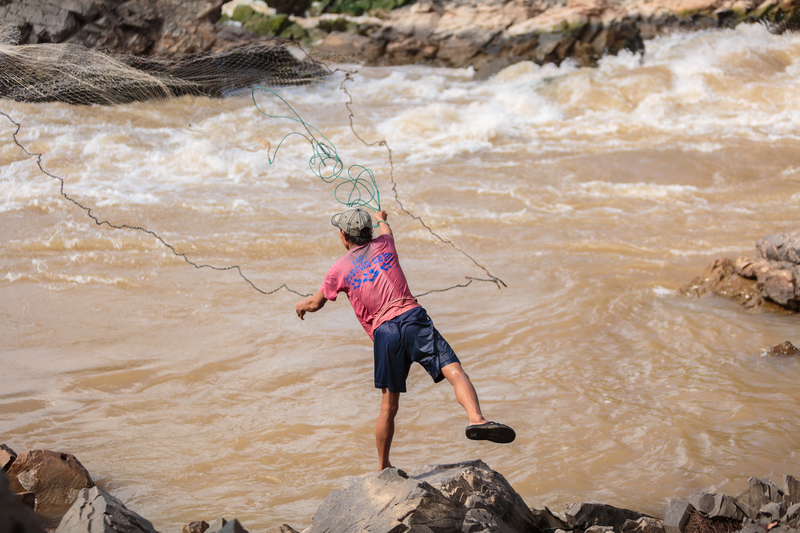 Good to know: Khone Pha Pheng is definitely a great place to go fishing.